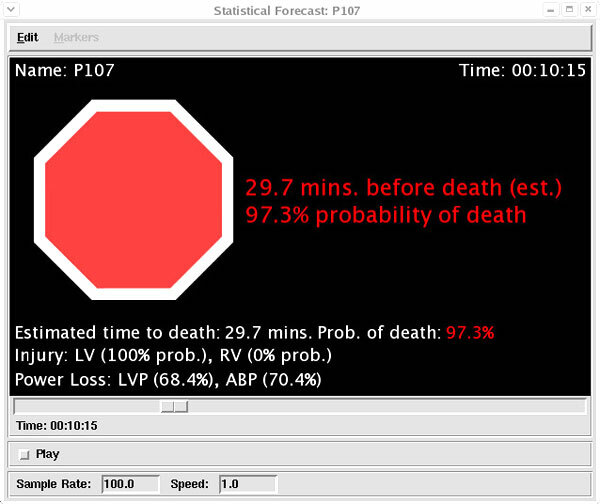 A display of the time dependent forecasts of survival vs. death, time to death, and estimated location of injury (LV vs. RV). Icons at the top of the display give a quick overview of the forecasts with text to the right and at the bottom of the display giving the numerical details. The icons: (i) a green circle indicating that the subject is likely to survive, (ii) a yellow triangle indicating that the subject is likely to die without intervention, and (iii) a red octagon indicating that the subject is likely to die soon. A question mark (?) is displayed in the center of the icons if the forecast is uncertain. An explanation mark (!) is displayed in the center of the red or yellow icons if an alarm has been detected. The display can operate in real-time, faster or slower than real-time, can be paused, rewound, or fast forwarded to specific times.